To begin, omni-channel retailing — or, omnichannel (meaning, all channels) — is a fully-integrated approach to commerce that provides shoppers a unified experience across online and offline channels (e.g., touchpoints). True omni-channel shopping extends from brick-and-mortar locations to mobile-browsing, ecommerce marketplaces, onsite storefronts, social media, retargeting, and everything in between (Shopify). Whether walking into your storefront, landing on your website homepage, or visiting your social media profiles customers expect consistency. But, in 2018, merely providing consistency is not enough. Rather, you must blur the lines between each customer touchpoint and provide a seamless experience. As an example, the option to buy now and pick up in store is not a new concept and yet, it has very recently become a huge initiative. Consumers are expecting their online orders to be in their hands faster than ever before. Brick and mortar stores are capitalizing on this customer need and offering in-store pickup in a matter of hours after an order has been placed online. There are two types of consumers: the consumers in a hurry who want to get in, pick up their order, and get out. The second consumer may purchase a specific item, come into the store to pick it up, and browse around to potentially add more items for purchase. Recently, many large retail stores have carved out specific parking areas for Buy Online, Pickup in-store (BOPIS), are installing pickup lockers in the front of the store, and some stores even allow you to select drive-up as a checkout method - an employee will bring out your order without you having to step one foot outside of your vehicle. “By the end of last year, nearly 45 percent of Home Depot’s online orders were picked up in-store, making BOPIS services an important area of focus for the chain” (RetailWire). 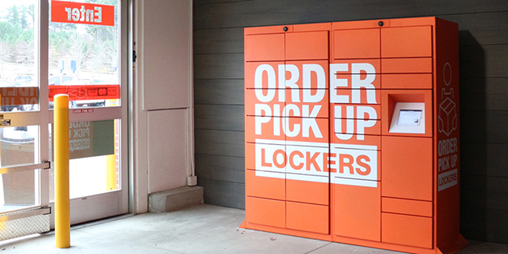 Digital giant, Amazon, is going beyond Prime two-day shipping to open up physical stores + pickup lockers. With book stores, pop-ups, and Amazon Go Amazon has seemingly effortlessly entered into traditional retailing. The convenience of shopping online is now even more attractive because packages are no longer bound to UPS, FedEX, or UPSP’s schedule. Rather, orders can be picked up at a time that is convenient for the customer. Peloton, the multidimensional home fitness company that offers boutique fitness classes in the comfort of your own home, arose from the desire to have flexible, on-demand access to classes. Peloton CEO, John Foley, asked himself “What if you could get a high-energy, instructor-led interval training class in your own home! ?” Working out at home was traditionally so boring and not very effective. John had an extensive technology and engineering background and understood the power of streaming capabilities and knew he could stream these high-energy effective workouts to people’s homes. And—there you have it—the Peloton bike was born (heymama.co). In Peloton’s case, the convenience of working out at home and having access to on-demand classes that work with your schedule led to the production of this game-changing bike. Technology, however, is the backbone of Peloton. “The combination of the spiritual component plus such a strong brand has helped Peloton achieve a rare station as a true omnichannel business: it is a dynamic system of hardware and software offerings, and it sells directly to consumers online as well as through its own physical stores.” – forbes.com. Technology is not just shaking up the fitness world. Brick-and-mortar retailers should look to Starbucks to see how to evolve with the times. The Starbucks mobile app is a great example of successful technology and BOPIS execution. Starbucks customers that download the app can make the morning (or afternoon) coffee run much easier and bypass lines by ordering via the mobile app and picking up in stores. The app gives users a look at Starbucks’ full food and drink menu and enables easy customization. Mobile payment in stores can also be achieved through the app. 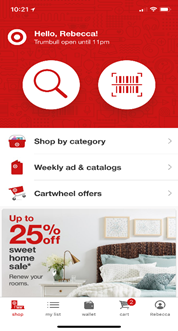 Another prime example of omni-channel excellence is Target and their mobile app. The app, based on your profile information, displays the store closest to you upon login. Each product description page (PDP) is configured with the option to find in store, order for pickup (BOPIS) or have it shipped to you. In search results pages, there is a toggle button that allows you to filter results based on whether or not it is located in your preferred store. Target’s cartwheel deals and merchandise on sale is easy to locate, which is perfect for savvy shoppers. In the post-recession era, shoppers have been conditioned to look for a deal. Anticipating the various shopping preferences of customers is key for success in today’s retail climate and being in tune with these needs is helping Target to connect with their customers. Beyond the ease of shopping, the Target app includes user generated content (USG). Sprout Social shares “One way marketers are approaching organic reach is through customer advocacy. By relying on customers and their followers, brands hit home with marketing efforts more effectively. One of the best ways to push customer advocacy is through user-generated content.” While providing a winning customer experience from checkout to delivery/pickup is of utmost importance you can take customer loyalty to a new level by making your customers part of your advertising strategy. Going back to the example of Target, both the mobile site and website have a section for #TargetStyle - a collection of UGC highlighting everything from apparel, cosmetics, housewares, snacks, and even dogs and their Target toys! Social media has ushered in the era of the influencer, and when done correctly, influencer campaigns can be incredibly powerful. Target has simplified this approach by allowing anyone to be an influencer, and helps customers feel a part of the brand. It’s no secret that retaining existing customer sis less expensive than acquiring new ones (Acquiring a new customer is five times as expensive as retaining an existing customer, huify.com). Peloton also excels in the area of building a community, first through the blending of showroom + merchandise. Purchasing a Peloton bike or treadmill is certainly not an inexpensive by. Fortunately, there are numerous Peloton Boutiques popping up around the United States, allowing interested consumers to try out the equipment (and even slip into the Peloton-branded cycling shoes) before purchase. Beyond the trial, the store sells branded apparel, weights, heart rate monitors, water bottles, headphones and more! When I popped into my Local Peloton Boutique to test a bike, I was impressed by how many people came into the store to peruse the apparel. The sales rep on duty commented that the apparel sells out so quickly online, it drives loyal customers to the stores to try their luck as finding their desired apparel. So, what is the key takeaway here? With the rise of athleisure apparel as every-day wear, Peloton is more than just exercise equipment in your home. Passionate users are going out into the world in their branded apparel and sharing they are a part of the community. To further foster the close-knit Peloton community there is a Facebook group that is “intended to be a community board for Peloton Members to share their experiences on the Peloton Bike, Tread and Digital. Those interested in becoming a Member are also welcome to join.” Peloton is keenly aware of their target audience, their likes, and the social media platforms they engage in (beyond the Facebook group, they have an Instagram page populated with UGC, inspirational quotes, and instructor highlights). With the growth of the internet and wealth of knowledge at our fingertips, today’s consumers are shopping smarter and looking for authenticity. They want to be a part of your brand – a part of something bigger. Creating a sense of community turns customers into ambassadors, and helps to organically grow your sales and customer base. To excel in today’s retail climate, there needs to be successful omni-channel execution. We, as consumers, have evolved. From fitness to food, we are not just shopping differently. Rather, we look to incorporate technology into more aspects of everyday life. Brands and retailers can maintain a competitive edge by studying their target consumers and their behaviors and adapting to deliver a convenient service for them, whether that be embracing BOPIS, offering faster delivery and a quick and clean checkout experience, or setting your sights onto the next big thing. No matter the initiative, technology and customer convenience need to blend together. Online and offline must be synched to ensure consistency across each customer touchpoint. By excelling at driving customer convenience, technology and building a community - you can create a lifestyle brand that will stand the test of time and achieve true omni-channel excellence.